The weather forecast shows that Saturday and Sunday are set to be warm and dry with plenty of sunshine so if you still haven’t visited the Christmas Market in Marno Pole Park, Veliko Tarnovo, the weekend seems as the right time to do it. The Market is open every day from 10 am till 8 pm and will continue up to December, 31st. This year the Greek Kontosouvli Chalet is in the spotlight – it attracts everyone with sizzling sounds and delicious aroma coming from the grill. Kontosouvli is actually a big kebab traditionally slow roasted on a spit turning over charcoal pit. The treat is priced at 6 leva per kg. The adjacent chalet is selling mulled wine and wormwood wine at 2 leva per 200 ml. 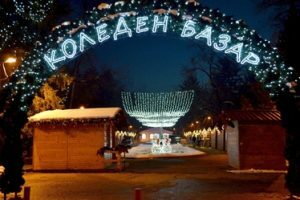 At the Christmas market you will also find Kazanlak Donuts, kattami (stuffed flatbreads) and Turkish delight. A variety of souvenirs, everyday items and toys are also available. A mini fairground with Ferry Wheel and Santa Post Office will keep the little ones entertained.